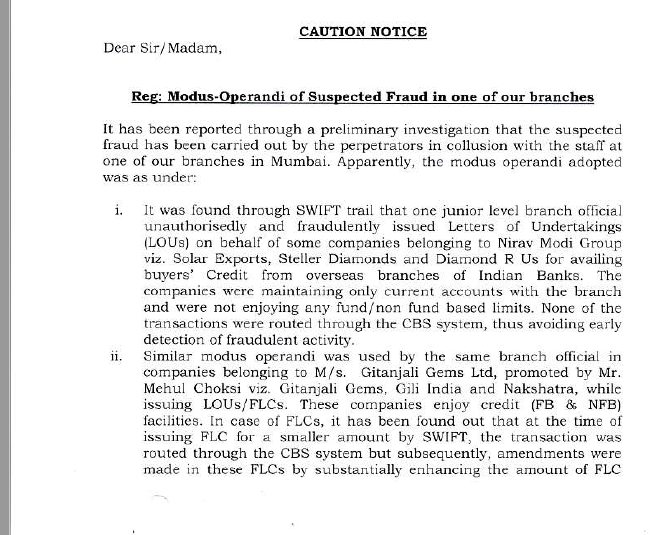 Punjab National Bank cautions other banks of fraud and explains how a few of its employees and Nirav Modi covered up the Rs 11,300 crore fraud. Punjab National Bank’s shocking revelation of fraud worth Rs 11,300 crore has roiled the financial markets and raised several questions on how massive financial irregularities went undetected for several years. PNB, the second largest public sector lender, has suspended 10 of its staff for being involved in the biggest fraud to rock India’s banking sector. The fraud involves Mumbai based diamantaire Nirav Modi and his associates. On February 14 PNB in a filing informed stock exchanges that it had detected ‘fraudulent and unauthorized transactions’ worth Rs 11,300 crore. The stock continued its southward movement on Thursday, closing nearly 12% down at Rs. 128.35 per share. But how did fraud transactions worth Rs 11,300 crore go unnoticed? BOOM has accessed a caution notice sent by PNB to 30 banks which details the modus operandi followed by the accused bank staff and the perpetrators in carrying out the fraud. The perpetrators refer to Nirav Modi group – viz. Solar. Exports, Steller Diamonds and Diamond R Us and Gitanjali Gems Ltd promoted by Mehul Choksi viz. Gitanjali Gems, Gili India and Nakshatra. 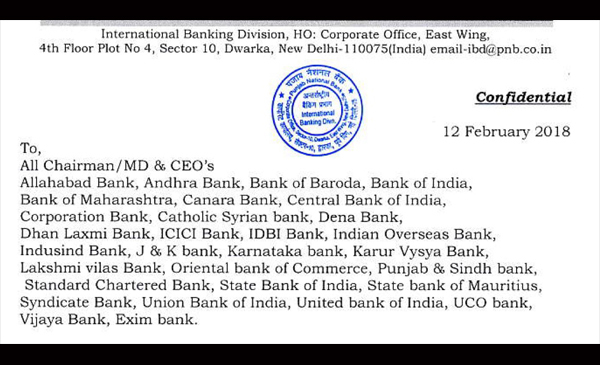 Though such transactions were being conducted for the past few years, it came to the notice of the bank only recently. The bank claims that these transactions were not noticed earlier as it wasn’t recorded in the CBS system – the software that records the core activities and transactions in the bank. However, the manner by which the staff bypassed the rules for the two companies ( Nirav Modi group & Gitanjali Gems Ltd ) was slightly different as explained below. The firm approached the bank to issue Letter of Undertakings (LOU) to which the bank asked for 100% cash margin. LOU is a letter of guarantee showing confidence in the borrower. However, the company claimed to have been availing this facility for years for which the bank could not find any records. This raised alarms and triggered further examinations. The letter also said the firm was only maintaining a current account with the bank. PNB says that it detected the fraud by tracing the SWIFT messages sent by the bank to overseas branches of Indian banks, in this case Allahabad Bank and Axis Bank. SWIFT (Society for Worldwide Interbank Financial Telecommunication) is a secure network for banks or financial institutions use to send information to each other. 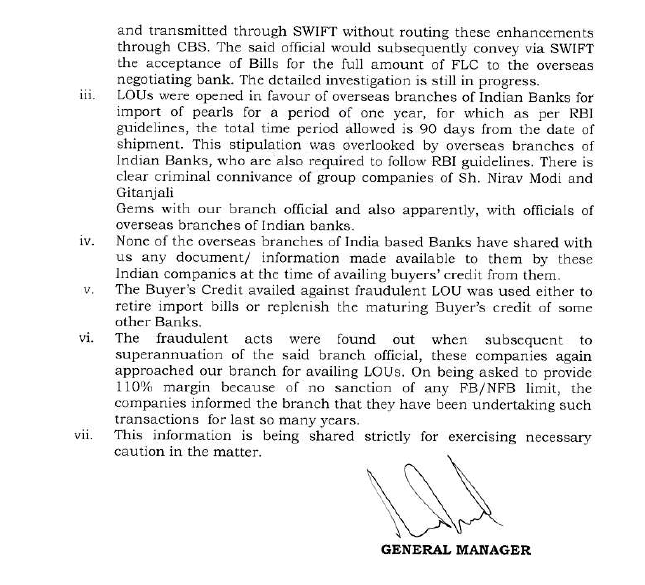 According to PNB’s letter, the accused staff fraudulently issued LOUs to the overseas banks so that they release funds to the suppliers of the firm for importing shipment (pearls). In the case of Gitanjali Gems, the transactions were recorded in the CBS. However, the LOUs were issued to send SWIFT messages to the overseas bank for smaller amounts and later revised to increase the amount. 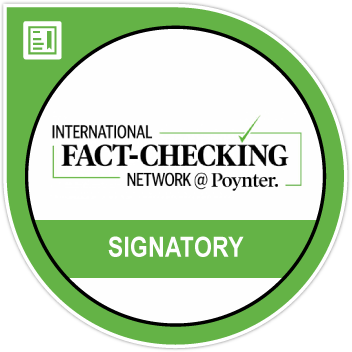 This change was not recorded in the CBS and thus not detected. Why is PNB claiming that other banks are also liable? PNB has said that other banks are also responsible as they overlooked 1 year validity of the LOU issued. According to RBI stipulations, an LOU remains valid only for 90 days from the date of shipment and firm needs to repay the amount by then.